Don Cheadle is playing Donald Duck in the one-hour season finale of DuckTales Season 1. In a new promo video that was released to announce that Don Cheadle was taking on the role, Disney jokingly referred to him as a "Thanos Survivor." The reference goes back to one of the actor's other gigs with Disney which is playing War Machine, aka James Rhodes, in the Marvel Cinematic Universe. Cheadle's character famously survived the snap of Thanos at the conclusion of Infinity War and Disney is having a little bit of fun with that fact in the new DuckTales video. The Thanos bit in the new marketing for the season finale of DuckTales is pretty awesome, but how is Cheadle going to play Donald Duck? That sounds like an incredibly difficult impression to pull off, which means that if the actor could do it, he'd probably have shown it off a few times before over the years. For those of us scratching our heads, the video explains everything. In the Season 1 finale, Donald is given an electronic device down his throat that automatically makes him understandable with the voice of Don Cheadle. Don Cheadle is clearly having fun taking on the role of one of the most iconic Disney characters in history, which is evident in the DuckTales promo video. Cheadle jokes that he really wanted to get to the essence of the Donald Duck character, so he stopped wearing pants and began to eat duck to prepare for the role. He reveals that the eating of the duck was to have it infused within him. He's obviously kidding around, but he's also having a really good time. War Machine was part of the lucky half of the universe who was able to survive the events of Infinity War and he's already been seen in the promotional art work for Avengers 4, front and center. However, it is unclear what Rhodey and the gang will be up to when the next Avengers movie hits theaters next May. While the roles of Donald Duck and War Machine couldn't be any more different, Don Cheadle is able to take them and put his own unique spin on things. The Russo Brothers have announced that Avengers 4 will be undergoing reshoots "soon," which means that Don Cheadle could be called to Atlanta for some additional filming. Since Cheadle has now played the part of Donald Duck, it's safe to assume that he will be bringing some of the Disney character to infuse him into the War Machine performance in the Marvel Cinematic Universe. 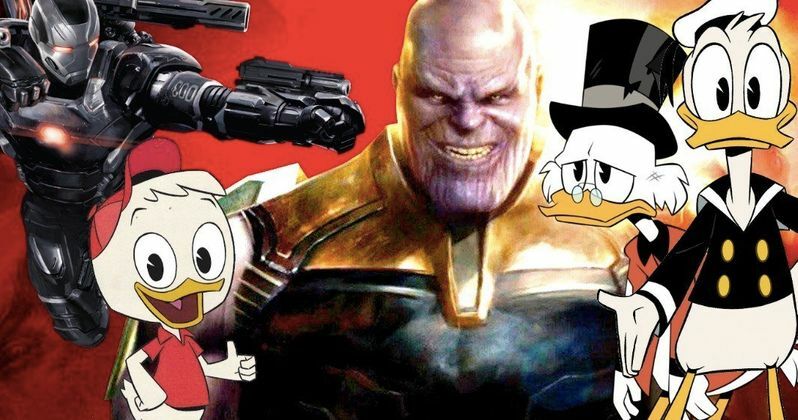 The season finale of DuckTales will air on August 18th, while Avengers 4 will hit theaters in May of next year. While we wait for both exciting events, you can watch the Don Cheadle DuckTales promo video below, thanks to Disney Channel YouTube channel.